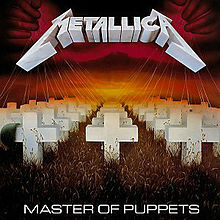 Next week is the 31st anniversary of the release of Master of Puppets. Depending on who you talk to, it's either a seminal moment in the advancement of thrash as a genre, or it's the day the music died. Both camps are probably right in their own ways. I actually bought Kill 'Em All when it first came out, just because the cassette cover looked cool, and metal. Apparently my 17 year old ears were not ready for thrash, as after a couple of plays it went back into the cassette case and would be ignored until Spring 1986, when I would revisit it and wonder what the hell I was thinking in 1984 when I didn't "get" Metallica. 18 year old sophomore in college me was into Master of Puppets immediately. The record still holds up fairly well when revisited today. The "epic" long songs, which were ground breaking at the time, sound a little repetitive today, as it's clear Metallica made them "epic" by taking 5 minutes songs and stretching them out to 8, without really adding anything but length. It worked though, so there is that. The song writing, which quite frankly probably went over my head in 1986, cover Lovecraft, One Flew Over The Cuckoo's Nest, and anti-war themes with Disposable Hereos. The title track is about the pitfalls of drug use, losing control and becoming controlled by the drugs. As the first thrash album that non-thrash kids like myself got into, it was an important record that made the possibility of large scale commercial access realistic for thrash bands, However, by unleashing the hordes of AC/DC, Ratt, and Def Lep fans into the thrash world, the scene was kind of ruined for the the kids that had been there since day one. I completely get that. 10 years later I'd be on the other side of that feeling, complaining that AOL ruined the Internet by unleashing its horde of clueless newbies on Usenet. To be fair, that really did ruin Usenet. I'm not sure I'm willing to take the fall for what became of Metallica.